Would You Read It Wednesday #149 – Your Friend, Conrad (PB) PLUS A Halloweensie Prize Update! I have to squeeze in a teensy Halloweensie Contest update!!! Remember how I told you that the prizes kept rolling in? – a picture book manuscript critique by Tracey M. Cox! Tracey offers a full critique on a fiction PB, 800 words or less, which will include overall impression and line-by-line on a prose only pb ms. She will also include thoughts and marketing ideas that she thinks about and if she can think of references, she’ll add them also. Tracey M. Cox has been writing professionally since 2000 and is an author of 6 picture books. She is an active member in the children’s literature community and explores how to self-market on little to no budget. – a personalized signed copy of I WANNA GO HOME by Karen Kaufman Orloff, the latest in the brilliant PB series that began with I WANNA IGUANA. – a personalized signed copy of NINJA RED RIDING HOOD by Corey Rosen Schwartz, the riveting follow-up to THE THREE NINJA PIGS. Since Halloween is coming, it’s important that we embrace the occasion in our chocolate snacks. Today (don’t be scared!) 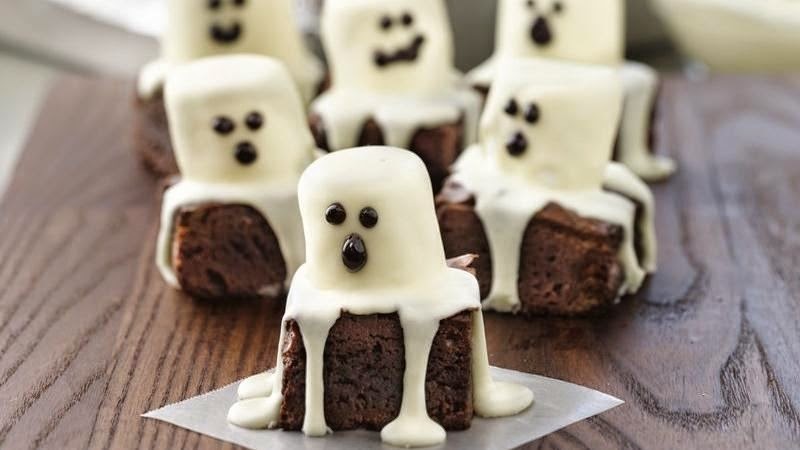 we have Spooky Boo Brownies!!! The Pitch: Conrad receives an invitation to visit his best friend Fiona. She tells him he’ll need to bring a sword, a bow and arrow, and … exactly ten marshmallows?! Conrad bravely sets out not knowing that the path will lead him into a leaky boat, past pesky ravens, through prickly brambles, and to the edge of a moat where a sweets-loving dragon lurks in the deep. Will this unlikely hero have the wits (and enough marshmallows) to make it to Fiona’s front door? Please send YOUR pitches for the coming weeks! For rules and where to submit, click on this link Would You Read It or on the Would You Read It tab in the bar above. There are one or two openings left for this year, since there will be a hiatus for the Holiday Contest and the holidays themselves, so polish up your pitch and grab one of the last couple spots for your chance to be read by editor Erin Molta before 2015! I'm glad you like the prizes, Teresa, and the sweets 🙂 You're such a good chef, you can probably make them! Thanks so much for your helpful comments for Debbie – pre-coffee brain or no, it's always good to know if there are parts that are confusing to anyone! Glad you like it Cathy 🙂 Thanks for chiming in for Debbie! Yes I would read it. I would like to read how Conrad makes it to Fiona's place. Debbie, you made me smile which is a good sign. Since people have been intrigued by the marshmallows, what about this for a title: (Susanna, your drum roll, please.) Exactly Ten Marshmallows. What do you think? Yes. Better! Or maybe even something more alliterative–Ten-Marshmallow Trouble, Ten-Marshmallow Test, A Ten-Marshmallow Trip/Trek. But the Ten Marshmallows in the title is really cool. Good luck. Okay. I'm sad. But I'll do my best to soldier on. Even without a story from you. Sniff. Sniffle. Really. I'll be fine. I'd like to read the book when it comes out. I loved the pitch but think it needs tweaking in a couple of places (not that I'm an expert). I think it needs a better hook like: One afternoon, Conrad recieved a curious phone call from his best friend, Fiona. She invited him to come to her house but told him to bring a sword, bow and arrow, and…exactly ten marshmallows? !